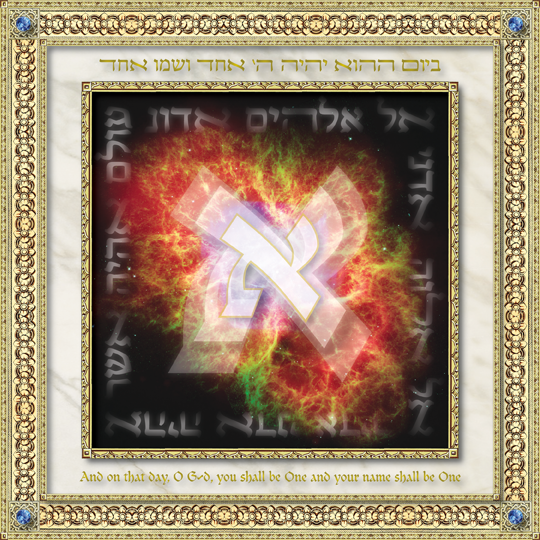 Pillars of Judaism :: "One"
The inspiration for “One” comes from the final line in the prayer “Aleinu” which is recited at the end of the Jewish daily prayer service. “And on that day, O G-d, you shall be One and your name shall be One”. It is this statement that affirms that our Creator is the singular source of true divinity. The highly embellished and jewel-inlaid frame surrounding the central image features the final line from the Aleinu prayer. These sacred words are etched in gold and appear to float over a polished marble base. 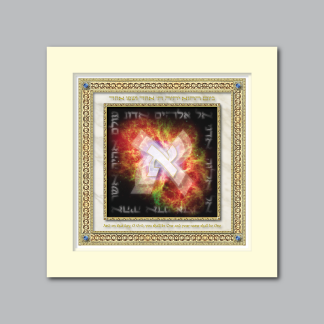 Featured in the central image is the “Aleph”. It is the first letter of the Hebrew alphabet and expresses a numerical value of 1. It also signifies the omnipotence of Hashem. This primary letter/symbol appears to burst from the core of the multi-hued and explosive divine spark. 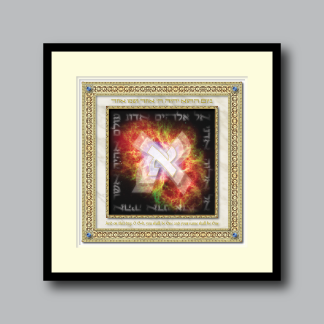 This “Aleph” stands as the presence of G-d permeating not only our universe, but the infinite dimensions of our existence. Finally, a halo of Hebrew words surrounds the “Aleph”. Each word a name for G-d, and each beginning with the primary letter of the Hebrew alphabet; the Aleph. This halo grows and expands to encompass us and flow through our lives like ripples on water touching every part of our physical, mental, emotional and spiritual lives.